I was contacted on Saturday 25th May by a lady desperate to find a home for 10 animals. There were 6 elderly Pigs & 4 goats, one lame. It was not totally clear what the situation was, but inspite of several weeks of advertising including radio, no-one was willing to help these particular animals. The larger charities were advocating having them all shot as they were old & unhomable in their opinion. Bess, the Grandmother to the family of pigs is 11, deaf & partially blind -but very friendly, and was living with her family, Sam, Miss Piggy, Specs, Flicks & Sarah. Maisie the goat has a deformed front leg & was living with another elderly goat, Dilly & two miniatures know as the "likely lads". Read about & see pictures of these animals in the Pigs & Goats pages. In order to check disgusting things like mites & fleas I shave off the long coats of the goats once a year - clearly as long as the weather has warmed up enough. With short coats it is easy to see how healthy the goats skin is & as a precaution I dust everyone with an appropriate mite/flea powder. 25th May - Manure anyone? I have at long last arranged for my muck heap to be removed & taken to a field across the road. It has become too large & was too big for me to shovel anything on top of. A local farmer arrived with a tractor & 15 ton trailor & a big digger thing that I can only describe as having a big grabber attachement! It took all day & guess how many trailor loads to remove? 10? 20? No ...42 loads !!! There are about 600 tonnes of well rotted manure in the field across the road and if there are any keen gardners in the Southminster area of Essex who would like a trailor load for their garden or allotment, please send me a mail & we can sort it out! I think I can spare some !!! It is as black & rotted as you can imagine & full of earthworms. It is my very sad duty to report that three animals have passed on this week. Firstly Bubbles the dog who has done so wonderfully well since being homed with me about 3 years ago. Bubby only had one eye & was about 15 when she arrived. She was due to be put to sleep then, but has had a fantastic three years with me here. 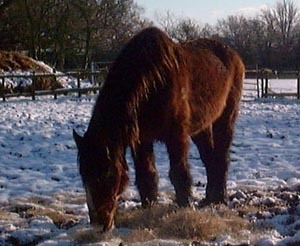 She has been spoilt rotten & has been very fit until about a week ago when she went off her food & started to collapse. She has always been a litle unsteady on her legs & was prone to making the odd "mistake" on the carpets! but she was such a sweetie she got away with it! On Thursday she was collapsing more frequently & I knew it was that time. It is always a very difficult decision to make. At 18 she had done ever so well, I will never forget her cheeky face. She had been going deaf for the past 2 years & I will never forget how I used to call her from the kitchen & when she eventually heard she would go trotting off in completely the wrong direction ! I will miss you Bubby. Secondly, Pinky one of my first rescues passed away in her sleep at the begining of the week. I don't know how old she was when she arrived about 5 years ago, but I would guess she was about 12. She died peacefully in her sleep during the night. There were no external signs that anything was wrong other than old age. Perky her sister is OK and does not appear to be distressed. Pinky was the dominant pig of the pair. The field on the other side of the road had no water supply, and every day last summer to get enough water to the horses, I had to fill a black plastic dustbin, balance it in a wheel barrow & ferry it across the road where I could bucket it out into the trough. As you can imagine this was a difficult task as it was, without having to dodge the traffic as well ! I contacted Essex & Suffolk water to enquire whether there was anything they could do to help the sanctuary out & they very kindly agreed to connect a supply with no cost to the sanctuary. I am particularly grateful to Ian, Mark, Dave & Peter who volunteered to give up their Saturday free of charge to help the sanctuary out in this way. 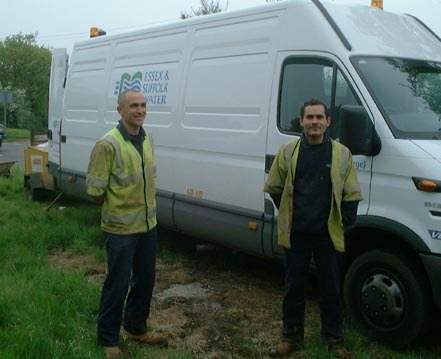 Ian & Mark worked very hard to get the supply laid on and all the men were extremely polite & helpful - a credit to Essex & Suffolk Water. On Friday 22nd March Mark Dowling & Andrew Alden both working for Mellon European Fund Services in Brentwood held a party to celebrate their birthdays. They very kindly arranged a raffle in support of the sanctuary & raised a fantastic £272. I am very gratefull to every one who supported the raffle & to those Mellon staff who donated the raffle prizes. Katie has been with me about 3 years, (see dogs page) She was about 14 year old. A few weeks ago Katie started to have difficulity in getting to her feet but was still eating her food & wagging her tail. However the vet told me that although there could be several things wrong, there were all fatal conditions and that she did not have more than a few weeks at best. A few days after this Katie weakened significantkly & stopped eating altogether, You can tell by looking into an animals eyes whether it wants to carry on living or not, & Katie's eyes were saying that she wanted to sleep. She was a very friendly dog & I am very sad at having to say goodbye to her, particularly as it was only 2 days after poor Bobby was killed by the Hunt. He was such a noble beast, standing nearly 19 hands high. He loved it in his field with his friend Max & I was so looking forward to see him blossom this Spring. I have loved him since saving him from slaughter 8 years ago, & he has taken me through hell & high water to keep him. He was so heavy, no-one wanted him on their land & he couldn't be housed in a stable as he didn't know his own strength & walls were never quite thick enough to stand up to his shoulder! But now he's dead. To see him die in this way has really taken it out of me. 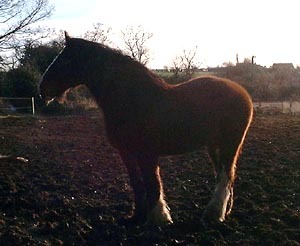 - Good bye Bobby - you were the biggest & most gentle horse I have ever known. It isn't being a very good year. I love all my horses, but there was something so very special about Malishka. Now she has been taken from me I am so distraught I am not sure at this point how I am going to face carrying on. 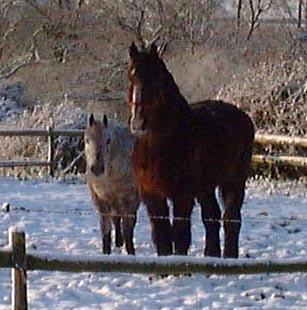 Malishka was the most trusting of the horses here & the only one of the 16 here I ever rode, albeit that I only rode her about twice a year as I was so paraniod that something bad would happen. She was fine when I fed her in the morning, but by the afternoon was sweating with a colic. I could see in her eyes that she was dying & called the vet out. She was operated on that night to remove a twisted section of her small intestine but in the early hours of the morning she stopped breathing. Words cannot describe how I am feeling. She was only 12 and had so much life ahead of her. I am struggling more than I ever have before. 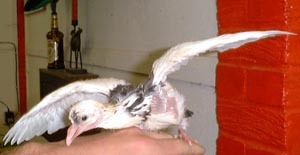 One bird, who I call Pee Wee, was so bad, she appeared to be blind as her whole head was just one enormous scab. Plus she had a hole in her chest 2 inches across which had exposed her insides. I tended her daily & after about a week, the scabs on her head started to lift & amazingly her eyes were intact below ! The hole on her body was also closing nicely. She was very shocked at first to see where she had been living (in a large box under the Christmas tree in the conservatory!) but soon got used to the assorted cats & dogs who she could now see. After a few more days she was well enough to go out down the stables with the other turkeys & although she still has the chest scab, she is happily running about with the others. 10th December - Bubbles fully recovered. I gave a home to a very large white long haired rabbit a few years ago, Big White Bunny as she became known was a real character. I do not know how old she was, but very sadly I found her passed away in her hutch this morning. There were no external signs of anything unusual I can only put it down to old age. I will miss her. I was just driving home along the lane & I saw up ahead in the road a little black bird just sitting there. in the opposite carriageway. Another car was approching & I naturally slowed down to allow the other vehicle to pull round the bird. Instead the driver completely ignored the poor thing & my attempts to flash her, and she ploughed right over him. I checked it was safe to stop & did so, got out & ran over to where the poor crow had been knocked too to see whether he had been killed or not. Luckly he was just stunned - I think he had been previously stunned by a car, hence the reason for sitting in the road. I took him home & made him a bed in a rabbit hutch & monitored him for the next few days. He must be a very determined bird as he quickly got better & I was able to let him go down the fields a few days later. It was a nice feeling to see him fly off into the the nearby trees. Bubbles the Dog managed to scratch her shoulder about 2 weeks ago & quickly went off her food. I knew something was seriously wrong as she became listless. Unable to move herself I called the vet who very kindly came out to her. An infection had got into her skin & she was running a fever. Antibiotics were given, & an injection to break the fever. Amazingly about an hour later she got up & went to the door. Unfortunately by the next day an enormous lump had developed (over 2.5" proud & about 6" by 4". I rushed her to the vet (about 15 miles) & they confirmed that a huge abscess had developed. Normally this size would require a general anaesthetic, but because of her age (nearly 18) this was not feasible. Instead brave Bubby, had a local & the abscess was drained. I won't describe how much infecction came out. A rubber drain had to be inserted across her back through the area & this was stitched in place. Bubby coped very well & is making excellent progress. The drain was removed earlier this week & she is almost back to her usual self. I will post some pictures on the dogs page. The end of the recent "mild spell" was well & truly sounded last night as torrential rain came down hour after hour. Asheldham brook runs at the bottom of the fields & is normally about 4 feet wide & about 2 feet deep. I estimate it is now over 100 feet wide & must be about 15 feet deep. All the fencing at the bottom of the fields has been washed away. Since I took this shot about 11 am today, the river has continued to rise. The stables (& my house) are thankfully on higher ground, but many of the local villages in this part of Essex are washed out today. Working with animals in these weather conditions is no joking matter, I am prone to pheumonia & have to make sure that I am as well as possible as my responsibility to the animals is paramount. I found her semi-paralyised last night with her two babies running about. I have re-hydrated her & adminstered a small amount of oral antiboitic. When animals get ill, it is really important to make sure thay have had water as when they can't drink them selves (or are unable to get to the water dish) they will quickly die of dehydration. Having treated Mrs Turkey (Big Bird) for a similar condition I knew what to do. This morning she is sitting OK with her chicks, so fingers crossed. I will continue with the treatment & if she does not improve she will have to go to the vet. The babies are about 10 days old now & are self sufficient, apart from the warmth they get from their mother at night under her wing. I have partitioned them off from the other birds & am leaving the the overhead lamps on for warmth. (not too much as that will de-hydrate them too). Rob, the lovable rogue, has sadly died. When he first arrived he roamed far & wide, but more recently he had stayed nearby (& in) the house. I had noticed him a few times in the road at the end of the drive, he seemed interested in the hedge (or rather the mice in the hedge) on the other side of the road. I found his body in the drive. I can only assume that he was knocked down & that either he was placed there or that he was trying to get back when he passed away. I wish people didn't drive so madly. 4 new ducks have been homed with me. Their previous pond had become too crowded & I was asked if I would give them a home. They are "indian" ducks & have settled in very nicely with the two Aylesbury ducks. There wasn't even a single squabble ! 29th August - Baby cows get a visit from the vet ! The three baby cows, Driver , Lamby & Hank had to be seen by the vet this last weekend as in irder to prevent them from turing into "Bulls", a certain procedure is required! I would have had them seen to much earlier, but because of the FMD I have not wanted a Vet to call here who may have been in contact with other animals at risk from FMD. Although the crisis is far from over, I finally managed to get a vet to come out who has not been involved with farm animals. The three babies needed a bit of tranquilizer to calm them down & all were very well behaved !! They are clearly very sore at the moment but the good news is that there does not to be any swelling which would indicate an infection, so fingers crossed in about 6 weeks they will be able to mix at last with the other cows without any risk of more babies! Sonny is a 17 year old blind cat, who had to be re-homed. My contact at the RSPCA asked me if I would take him as clearly it is very hard to find homes for cats at this age, particularly if they are severely disabled. I picked Sonny up from Southend today. He is in the kitchen at the moment coming to terms with his surroundings. It took Toulouse, a blind Siamese cat a good few weeks to get used to the lay of the land, and I am sure that Sonny will soon find his way about. Dusty was a very sweet little thing. He came to me about 18 months ago as un-homeable because he suffered from a chronic form of rhinitus. This meant that he generated a considerable amount of nasal mucas which he used to sneeze all over the place. The vets who had seen him had been unable to resolve the problem, but apart from the mess he was a happy & very playful little cat. He was originally intended to be an "outside" cat, but soon weedled his way inside whee he stayed for the vast majority of the time. Last night I noticed he breathing was quite strained, but by the morning he seemed a little easier. However I took him to the vet as soon as they opened & they looked at him today. At lunchtime they phoned to say they needed to X-ray Dusty, which I agreed to, but soon after this his breating deteriorated & he stopped breathing altogether soon afterwads. The Vet does not know what the problem was but believes it to be some form of chest infection. Today I have been pushed beyond the limits of reasonableness. On top of all the normal work - which is a full time job by anyones standards - I was awoken at 7:30 am with a phone call as a fox was injured in someone's garden & they needed help. I arrived & found him cut & trapped by a wire fence. The 7 male firefighters already present were considering how best to avoid being eaten by the fox & were no doubt working on a cunning plan. Fortunately I had brought a blanket with me + a carry case & carefully but firmly held the fox by the neck to avoid the teeth & then covered the body with the blanket - please never try this yourself - contact a resuce organisation. Having pinned the animal down, it was a simple job for a fireman to cut through the fencing enabling me to swiftly bundle the animal into the carry case. Fortunately my vet was on call & agreed to take the animal in at the practice (18 miles away). I also contacted a local fox rescue organisation in Bradwell who will look after him as soon as he has finished treatment & will release him where he was found when the time comes. Later that morning Katie one of the dogs had a fit, lost her balance & control of her legs & her eyes were rolling from right to left. I was worried sick & had to arrange quickly to get Katie to the vet. She was seen immediately, although the symptoms had resided by the time she arrived. he was given a steroid injection for her nervous system & prescribed some anti epeleptic tablits as a precation. Unfortunately being the weekend I had to pay fore out of hours treatment & the bill was over £60. In the afternoon I was asked to collect 2 cats from a Southend cattery (25 miles) as they were looking for an "outside" home. When I got there a large charity who shall remain nameless had become involved & decided that as the cats situation had not been vetted by them, I could not take the cats !! So, I drove home, the cats are still there - looking for a home?? huh? Lastly & very sadly, Primrose the very elderly cat who I have looked after for 3 years, she was about 19 died on Sunday night around midnight. She was active right up until about an hour before, although these past few weeks, she has lost weight. She was still eating & there was no reason for me to believe that she was sufferring. She was a dear little thing, so friendly. I will miss her. Binky the cat has been in the ferel run now for enough time to have become used to the surroundings & associate the run/stables with food. I will leave her door open tonight & let her establish her postion within the cat community. Update: She spent the first few days near her pen & has now moved further afield. She is keeping a low profile at present, but I am sure she will soon gain confidence. I just wanted to say a big thank you to all our supporters. In the last few weeks, sponsorships have grown to 8. It really means a lot to me to see that there are people who care enough to want to help me care for all the rescued animals & birds.Thank you again for your support. I have been trying to get the Spring newsletter together in the last few weeks, & hopefully it will be posted out to you all before I have to re-name it the Summer Newsletter ! Bennie, the turkey - see below april 9th, was not in great condition when he arrived - ironically it was this fact that had saved him from slaughter. Bennie had settled in well wih the other turkeys, but despite a good diet, he never started to improve his condition. I became suspicious of a swelling in his breast, & had a vet look him over last week. The vet confirmed that there was something partially blocking Bennie's gullet, & recommended that I try him with liquid paraffin to try & shift it. A week later there was no improvement & I booked him an operation for next Tuesday to have whatever it was removed. This is always a big risk with poultry as they do not cope with anasthetic very well at all, but I could not see any alternative. Over this weekend however Bennie's condition suddenly worstened & it was clear to me that had to see a vet immediately. Poor Bennie passed away in the car on the way. It is a small consolation that at least he had a few weeks of freedom here, as his previous life as for nearly all turkeys had been wretched. I collected a new cat on Sunday evening from a family who were unable to keep her any more. She is called Binky and has a bit of "feral" in her. She was moved into a run down the stables last night where she will stay for at least 4 weeks whilst she gets used to her surroundings. Quite a few of the other cats were keen to see what was going on - along with assorted turkeys & Marney the sheep. I will post Binky's picture on the "ferals" page in the next few weeks. The green duck that appeared last Autumn, (see Poultry page) has vanished as mysteriously as he arrived. I am hoping that he has migrated somewhere rather than anything horrible happening to him. Fortunately there are no traces, i.e. lots of feathers that would indicate a struggle, but he had started to fly out of the enclosure a few times & I have had to recently pick him up & pop him back with the Aylesbury's. I hope he will stop by again in the future. I heard that locally to me a man had a cockerel he no longer wanted & was planning to kill him. Fortunately I managed to get a message to him to say that I would home him. An agreement was reached & I collected the bird (now called Mr Chicken) last night. He is very small & I will not be able to put him with the other cockerels as they are about 10 times his size & may not get on with him. I have built him a tempoary enclosure & will sort something more permanent out this bank holiday weekend. A new turkey arrived today. The farm up the road had quite a few damaged birds left after Christmas and these had all been sold now for Easter celebrations. (?). All save one bird who was too ill to be sold. Fortunately the farmer offerred him to me before culling him. I have called him "Bennie" & he is currently wondering what to do. He is sitting in a sectioned off area of the stables, whilst the others get used to him & while he comes to terms with the new surroundings. Big Bird (from below) has made incredible progress. I knew she wanted to live, many people including the vets who saw here told me it would be better to put her down, but I knew that she wanted to fight. I know people will laugh but it is possible to tell when an animal is giving up, & usually the smaller ones do tend to give up when seriously ill & pass away quickly. Big Bird on the otherhand did not. She spent about 2 weeks in the utility room & then about 3 weeks in the conservatory. If you have ever had to manage a disabled 60ilb turkey in you home, it's not something you can do lightly. If a wing beat catches you in the face it can be very serious. In the first 4 weeks I was having to syringe liquidised food down her throat every 2 hours in the day & about evet 4 hours at night as she was unable to feed herself, & all she could do was slump in the wooden box I made her. Slowly she started to get the use of her legs back & last week I was able to move her into a dog kennel & run in the yard. To see her now walking about now, albeit a little unsteady on her legs, brings me almost to tears. She eats about 2ilbs of feed a day unaided which is just brilliant. I am convinced she suffered a stroke & will keep a close eye on her until she is fit enough to go back to the others. The "others" wander up to her run & I often find them sitting down near her exchanging chiriping noises ! This has really taken a lot out of me. Clearly I am under considerable stress at this time, with my worst fears as recurring nightmares for as long as the country is gripped by this disease. The nearest outbreak to the sanctuary is only 8 miles away & I have taken all the precautions I can. The drive is fully disinfected every day & all the susceptable animals are in stables inside the main stable block. Meg was a 14 year old white English Bull Terrier who was homed with me just before Christmas (see Dogs page). She was a dear little girl & really settled in brilliantly with the other doggy residents. She was taken ill last Friday following a few days of being sick. The vets ran tests & X rays & found that she was in the advanced stages of lung cancer. I can't belive that she has gone. I spent a few minutes with her last night at the vets - I was determined that she would be able to come home for a few more days, but when I saw her, she was just too ill. I kissed her goodbye as the vet put her to sleep. I cannot begin to say how upset I am. This is a problem in taking on "older residents" & it really tears me apart. One of the Turkeys from the most recent batch is a big turkey - she weighed about 60 lbs (27kg) when she arrived - has been taken ill. I took her to the vet but unfortunately they don't tend to get a lot of turkeys to look at and are not 100% certain what the problem is. This is a really long story & I will publish the full story in the Spring newsletter which will be issued to all members/supporters in April. Big bird has not given up yet & has not stopped eating & drinking. I am however over £550 worse off from vets fees! Any donation - no matter how small - will be gratefully recieved as I just can't afford these fees. Clearly if Big Bird starts to suffer I will have her put to sleep, but I we are not at that point yet. She has recieved several e-mails from well wishers from all round the world. Two gerbils have been added to the collection. They are a mother & daughter whose owner was unable to keep them any more. They have settled in well, in the "hammy" room. One of the 6 Turkeys we saved from slaughter passed away last night. She was the one who had the most damage, (pecked eyes & quite a few open wounds). I did my best for her to bath the wounds, but clearly she was too weak from it all to survive. The only consolation for me is that at least she passed away on a bed of straw in the peace & quiet. Unfortunately, they failed to get back to me & so I am feeding Percy 4 times a day myself. Here is is 1 week later & doing really well. UPDATE JUNE '02 - Percy lays an egg !!! - Oh dear.... whats the girl version of Percy?? Ian & Mark pose for the camera !